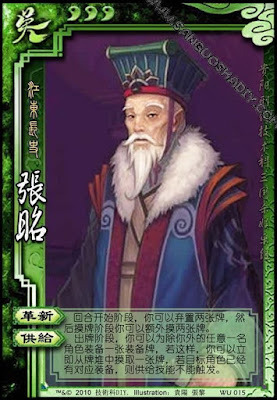 At the beginning of his turn, Zhang Zhao can discard two cards. Then during his drawing phase, he can draw two additional cards. Zhang Zhao can play equipment onto any other players empty equipment areas. When he does this, he draws a card. Zhang Zhao cannot replace any equipment that a player already has.